Karen van Ulzen meets two new overseas recruits. 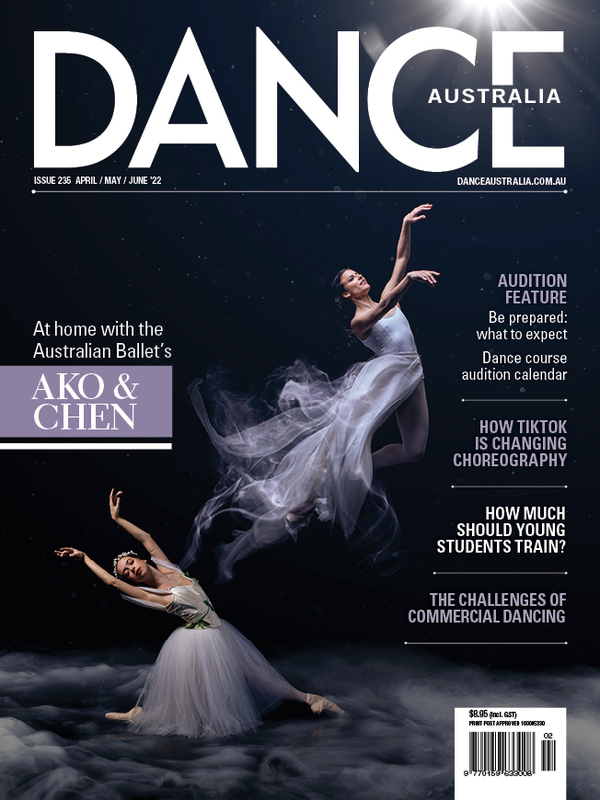 The talented and multifaceted troupe at Sydney Dance Company (SDC) gained two new faces at the start of this year – Ariella Casu and Victor Zarallo. These charming dancers both hail from overseas – charming and charmed by their new, sunny circumstances. I caught up with them not long into SDC's 2018 season, at the company headquarters in Walsh Bay. It is always a reminder, when greeting people new to this company, just how extraordinary and exotic SDC's location is – headquartered in these cavernous historic wharves, built with massive, lanolin-soaked wooden beams, jutting into the glistening, flashing water. They are at once so solid and permanent, wide enough for trucks to drive their concrete length, yet detached from land, a patchwork of timber and glass, floating into the ever bobbing, clinking harbour. Casu is Spanish. He grew up in Sitges, a coastal town near Barcelona. At the age of 15 he was a champion ballroom dancer. At the various competitions he attended, however, he noticed that the male Russian and Eastern European ballroom dancers all had an extra edge on other nationalities. “I asked my ballroom teacher, why are they so good? And he told me it was because they do ballet. Through the teacher's contact he found a place in the John Cranko School of the Stuttgart Ballet. Without having any of the language and with a mere three months' ballet training, he went on scholarship to Germany. As a typical boy I was against ballet. Ballet was for girls. Zarallo stayed at the Scottish Ballet for 10 years, progressing from apprentice to soloist. During this time he danced the role of the Prince in Christopher Hanson's Cinderella, the Prince in David Dawson's Swan Lake, the title role in Glen Tetley's Pierrott Lunaire, and in works by major choreographers such as Jiri Kylian, Hans van Manen, Crystal Pite and Angelin Preljocaj. He was nominated as Dancer of the Month by the Dancing Times.Norman was true to his word, and Zarallo graduated from the RBS after two years, landing a contract immediately with the Scottish Ballet. "And there's another connection with Australia,” he says. “I performed Natalie Weir's Unwritten, at the end of third year. She came and chose me and my best friend to do the performance.”“He asked me why was so sad. I didn't know who he was. I explained to him and he said, 'I saw you in class this morning and you can make it, you just need the right training with people who are patient. Don't worry, I'll talk to Gailene and you have a position in the Royal Ballet School by next month.” By Gailene, of course, he meant his wife, the late Gailene Stock, who was the director of the school.At the end of hIs first year it appeared his luck had run out. He was called into the office by the school's director and told he had not passed and would not be asked back. Devastated, he ran into an Australian, Gary Norman, as he was leaving the office. Norman was in Hamburg in his role as senior classical teacher with the Royal Ballet School, which was visiting the Hamburg school for a joint performance. When Schreiner became director of the Gartnerplatztheater Munich, she followed him, where she remained from 2011 to 2017. She revelled in the company's repertoire, which included many of Europe's hottest choreographers, some closely associated with Netherlands Dance Theatre, including Alexander Eckman, Marko Goecke and Edward Clug. So why did this pair of Europeans end up in the Antipodes? For Zarallo, it was a matter of continuing his artistic development. After 10 years with Scottish Ballet, he found he was starting to repeat roles. Also, there was another Australian connection –- his girlfriend, Gold Coast-born Mia Thompson, who recommended SDC to him. Surprisingly, he was not aware that it was directed by a compatriot, Raphael Bonachela! Though Zarallo was unable to audition in person, the company arranged for him to audition by video. “And now I'm here!” he beams. Her friend, Davida di Giovanni, received a contract immediately. A year later it was Casu's turn to be offered a job. Now both are ensconced in the company, and are thrilled at their good fortune. “They definitely work really hard here,” Casu says. “It's a company that doesn't give you time to get bored. You are always engaged and learning and mostly the brain is working at the same time as the body. We had to study three videos when we got here in two weeks –- a lot of rep to learn, which is great. And Zarallo: “At the same time they don't put you under any pressure. Australians are really chilled. I was worried I had to learn everything, but they were 'don't worry, don't stress, take your time'. You work better when they are nice to you, they don't make you feel like you are bad when you don't know something. They don't put you down. Both are rejoicing in the Sydney climate. “Just waking up knowing that it is February and the sun is out. You wake up and it's like – let's go to work!, Casu says with a smile. Photos of Victor are by Barrie Spence; photo of Ariella by Aishlinn McCarthy, photo of both in casual mode by Pedro Greig.